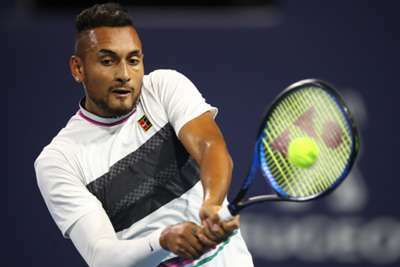 Nick Kyrgios delivered a spectacular performance to move into the last 16 at the Miami Open, while Novak Djokovic was below his best but advanced. Australian 27th seed Kyrgios put on a show in dismantling Dusan Lajovic in the third round on Sunday. Djokovic was unable to reach his usual heights, while defending champion John Isner stayed on track at the ATP 1000 event in Florida. It was a strong day for the seeds, with only two – Milos Raonic and Fabio Fognini – losing. Kyrgios has enjoyed playing at the Miami Open, and that continued in some style. The 23-year-old thrashed Lajovic 6-3 6-1 on the back of a scintillating performance that included two successful underarm serves. Kyrgios also produced a no-look volley winner and was involved in a verbal exchange with a spectator in a characteristic performance. He is a two-time semi-finalist in Miami and looks capable of another deep run. Kyrgios will next face Borna Coric after the Croatian 11th seed got past Jeremy Chardy 6-7 (2-7) 6-2 6-3. World number one and six-time champion Djokovic was unconvincing in a 7-5 4-6 6-1 victory over Federico Delbonis. The Serbian 15-time grand slam champion gave up leads in the first and second sets, but made no mistake in the third. He will face Roberto Bautista Agut after the Spanish 22nd seed proved too good for Fognini 6-4 6-4. On the back of 16 aces, Isner recorded a 7-5 7-6 (8-6) victory over Albert Ramos-Vinolas. The American will meet Kyle Edmund after the Brit upset Raonic 6-4 6-4. The other last-16 clash in the top half of the draw will be between the in-form Felix Auger-Aliassime and Nikoloz Basilashvili. Auger-Aliassime, 18, continued his good form by beating Hubert Hurkacz 7-6 (7-5) 6-4, while Basilashvili got past Robin Haase 7-6 (7-3) 6-3.